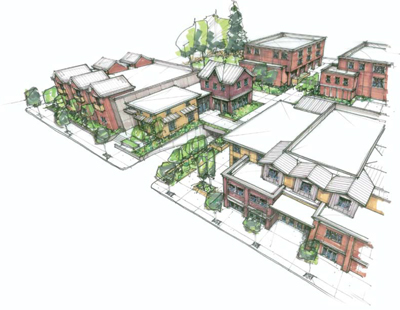 Reviving the lost art of place-making The Village at Hailey Center creates a vital urban center for Hailey, utilizing the stacking and weaving together of garden retail, professional offices and spacious residential units. With future underground parking as well as an open area interior courtyard with paved paths, trees, and grass, this setting will offer multiple open air dining facilities in addition to providing a display and common area for local artists, community events and promotions. “The objective is to create within the Hailey downtown core an environment designed to cover the range of historical Blaine County architecture, and to do so in a way that adds substance and sensitivity to our unique community,” described the project developer, Jon McGowan. The Wood River Valley has come a long way since Austrian Count Felix Schaffgotsch explored the country in 1935 looking for the best and most beautiful spot for a destination resort on behalf of industrialist and railroader Averell Harriman, thus transforming the mining and sheep ranching settlement of Ketchum into the premier destination for the world’s prominent families. Over time, each community in the greater Sun Valley area has developed its own identity. While the Sun Valley/Ketchum area represents the resort aspect of the community, Hailey serves as the residential and commercial core, with the south valley representing the historical ranching and agricultural segment. McGowan discussed his view of Hailey as the growing commercial center of the region. “This is where people live and do business, so creating offices where both professionals and their clients live only makes sense.” Additionally, the Village retail will encourage residents to buy and spend locally, which means that dollars will reverberate again and again throughout the community, helping their neighbors. Located on the west side of Highway 75 between Walnut and Pine Streets, the centrally sited property once owned by the Forest Service is just a block or two from the Court House and the City and County offices, a natural Town Center. The complex’s steel and masonry green design builds on the concept of a community core with architectural references to the community’s history. Recognizing that this property is one of the key properties in the community architect and planner Tobin Dougherty was enlisted to do it right! 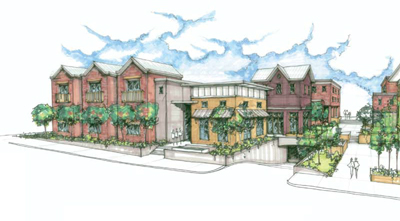 The Village brings vibrancy to the New Urbanism concepts of neighborhood and community. It is anticipated that future parking will be underground and therefore convenient as well as pedestrian friendly. The ground floor retail space works especially well for restaurants with outdoor seating or other uses requiring ground level access such as surgical centers, pharmacies, or perhaps sports rehabilitation facilities. Second and third floor professional office suites feature 11-foot ceilings, double-hung sash windows, decks, everything new in electronic support, energy-efficiency, detailed woodwork and one-hour fire rated doors that happen to be beautiful. All are for sale, so the owners can gain equity and participate in the financial future of not only the Village, but the community as a whole. The first phase offers one 1,657 square-foot loft with a spacious deck with more lofts planned for subsequent phases. 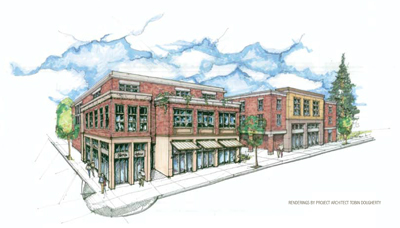 The Village at Hailey Center is currently a promising new opportunity. Over time it will become a landmark. To see it, stop by or visit www.investsunvalley.com.